This is Wiss. I hope you have enjoyed the posts so far? I am really excited to introduce my final special guest for today's blog: Kelli writes her Tales from Homemade House and blogs all about her busy (but fantastic sounding) life with her four children. She cooks, crafts, grows her own veg, and has a passion for a simple, more fulfilling life and writes about it all in such a lovely and genuine voice. "Books have been an important part of my life since I was very young. I was a regular visitor to my local library throughout my childhood years. The earliest books I can remember are those wonderfully illustrated, heart-warming tales by Shirley Hughes. I read anything and everything as a child and if I had a book in hand I was totally absorbed and transported within the pages. Hans Christian Anderson, Enid Blyton, Point Horror...they all hold fond memories for me and now that I have four children of my own it has been an exciting journey to see how each of them have reacted to books and how their tastes have been similar or drastically different from my own at that age. Here I will give a rundown of the books that are currently holding my children in thrall at the various ages and stages each of them are at. Starting with my eldest who is 9, and currently the most reluctant reader of my brood, it has often been a challenge to find books that interest or excite him. A logical and inquisitive boy, we started him off on factual textbooks from dog training to the solar system, anything that held his interest. In an attempt to develop his imagination there is a series of books that were by far the best for holding his attention and for giving him the enthusiasm to want to read more and they have to be the wonderful ‘Mr Gum’ books by Andy Stanton. Full of humour and illustrations that are reminiscent of Quentin Blake the books tell the story of the crotchety, smelly old man who has become a firm favourite in my son’s opinion. With much gross humour and the odd made up words these tales have my son laughing out loud and excitedly reading his favourite passages to anyone who will listen. For that alone Mr Gum gets my full vote too. Next is my 7 year old. She is an avid reader with a wild imagination and will read anything she can get her hands on, and with a bookcase that is bursting at the seams with excellent authors it has been very difficult whittling them down. There are, however, two classic authors that outshine the rest with their ability to capture children’s imaginations regardless of what decade it is. First is Enid Blyton who writes about everything from midnight feasts at boarding school in ‘Mallory Towers’ to daring adventures with the ‘Famous Five’. Blyton was always a firm favourite of mine and it has been such a joy to pass this love down to my own child and relive the adventures anew with her. Second has to be Roald Dahl for his humour, the gripping, page turning fear and the possibility that anything at all could happen. He takes children on a rollercoaster of emotions, laughing aloud one minute and hiding under the covers the next. His characters are big, ferocious and lovable all at the same time and keep children, (and adults), always wanting more. For my three year old daughter there were many authors who had written excellent books such as Julia Donaldson’s ‘The Gruffalo’s Child’ and Eileen Brown’s ‘Handa’s Surprise’, but for a whole series of books our definite bedtime favourite is Dorothy Edwards and her ‘My Naughty Little Sister’ series. Very like the books by Shirley Hughes, Edwards has a lovely homely, timeless feel in the way she writes and she manages to portray the viewpoint of a child in this age group perfectly without it ever feeling belittling. Her stories have been wonderful to read aloud to my daughter and, after all, if the story teller doesn’t enjoy reading it then the listener will never enjoy hearing it. Lastly is my youngest son who has recently turned 2. Throughout the day the books he enjoys are those brightly coloured board books with clear pictures of the ordinary things he sees about him daily, those things he is just beginning to form the words for. They give him an immense sense of achievement to recognise and pronounce the word for each picture and vitally they give him the confidence to handle and enjoy books. 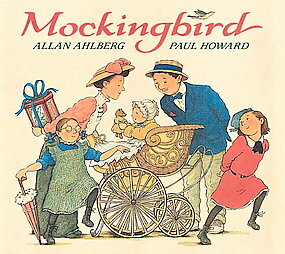 For bedtime, however, there is one all time favourite that has been passed down all four of my children and it is perfect for that sleepy, relaxing time just before bed... Allen Ahlberg’s ‘Mocking Bird’. With its beautiful and detailed Georgian illustrations by Paul Howard it is written to the tune of the original song and whether read or sung gently it is definitely a wonderful book to end the day with and it is the one book above all others that fills me with the memories of each of my children’s sleepy bedtime routines at this age. I hope you’ve enjoyed reading about our favourite books and hopefully it has inspired you to take yourself and your little ones off to the library or bookshop to see what adventures you can find amongst the shelves. I’d like to say thank you to Angela for asking me to write this guest post for her blog and for World Book Week and I hope you have all enjoyed the fun posts and pictures that have been featured throughout the past week by all the talented ladies who have participated." Thank you Kelli for rounding off the week so beautifully. There is something very comforting in the fact that your children are enjoying today all the books that you, and many of us enjoyed in our childhoods, a *few* years ago! and I hope you have too? I will be taking a couple of days off from blogging now as I have all manner of mundane tasks to get through, before getting back behind the sewing machine. Thank you all for stopping by and please do leave a comment below if there's anything you'd like to add. What a great selection of books Kelli. 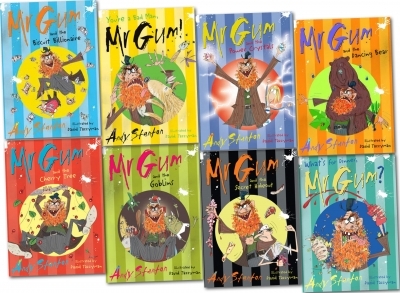 I will try my son on Mr Gum. We bought him the David Walliams books but he wasn't that keen. He mostly reads comics but I have to tell myself at least he's reading! Thankfully the others are bookworms like their Mum.